Home » Charlie Montgomery, Jr.
Charles “Charlie” Montgomery Jr. is a Director at Large. A U.S. Army veteran, he served in Vietnam with the 173rd Airborne Brigade from 1969–1970, and with the 82nd Airborne Division from 1970–1971. Montgomery joined VVA in 1987 and is a life member of VVA Chapter 969 in Virginia Beach, Va. Committed to serving his fellow veterans, he has been active at the chapter, state, and national levels. 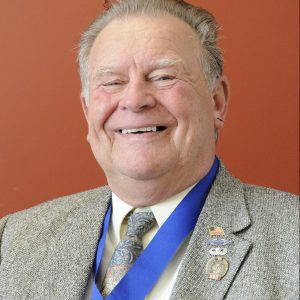 He serves on the board of Chapter 969, is serving his eighth term as VVA Virginia State Council president, and served five terms as chair of the Conference of State Council Presidents. He has served on the VVA National Board as a Director at Large, as a Region 3 Director, and as National Membership Committee Chair. He has also served two terms on the Vietnam Veterans Assistance Fund, now known as the Veterans Support Foundation. Montgomery is also a recipient of VVA’s highest award — the VVA Commendation Medal. He has served as vice president of VVA Chapter 969, chair of the Virginia Beach Mayor’s Veterans Committee, and vice president of the Hampton Roads Council of Veterans Organizations. Montgomery retired in 2011 after 40 years of service with the City of Norfolk, Va., where he lives with his wife, Nancy.